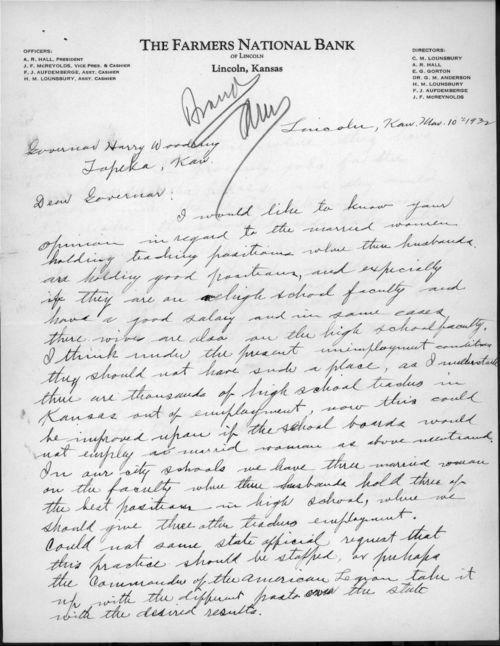 The mayor of Lincoln Center (Lincoln County), F. J. Aufdemberge, writes Governor Harry Woodring of Topeka, Kansas, with a plan to help reduce the high number of unemployed men in the state. Mr. Aufdemberge suggests that married women whose husbands are employed should be required to resign and let unemployed men have those jobs, especially in the case of women teachers employed in high schools. Between 1930 and 1933, Kansas experienced a dramatic rise in unemployment. Woodring's Governor's Committee on Unemployment favored work programs at the local level rather than cash relief programs funded by tax increases. By July 1932, Woodring appealed to the federal government for help and established the Kansas Federal Relief Committee to administer the federal programs. See Governor Harry Woodring to F. J. Aufdemberge, March 23 1932.